New Community Garden in Planning for Girard Street | Park View, D.C.
At last night’s meeting of ANC 1A, the Commission was presented with a proposal by residents in the vicinity of the 1300 block of Girard Street to turn a closed alley on the block into a community garden. The alley in question is on the north side of Girard Street between 13th and 14th Streets (about 1/3 the way to the east of 14th). The alley appears to have been closed for some time and has a fire plug blocking it at the street. 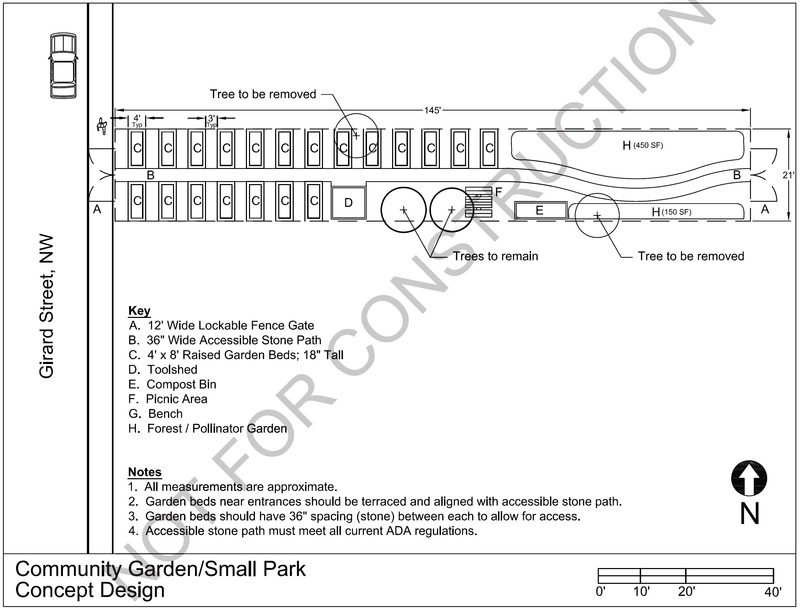 The garden would be created and built by the D.C. Department of Parks and Recreation and run by local residents. The space currently contains a number of trees and an assortment of vines and other small plants. The plan calls for an arborist to assess the health and species of the trees currently on the site. Non-native, invasive trees and smaller plants will be removed to create the garden. The large, native catalpa tree at the center-east of the lot will almost certainly remain and lend its name to the garden as Catalpa Garden. ANC 1A voted unanimously to support the project and looks forward to seeing the plan move ahead. Below is a plan of the proposal. This entry was posted on January 15, 2015 at 7:01 am and is filed under Lawns and gardens. You can subscribe via RSS 2.0 feed to this post's comments.